This is my favorite find from a recent trip to Anchorage. I was wondering through a sweet little shop downtown called Balliwick. The shop is small and well-curated with a sense of humor. And the last time I was there in December, I found a wonderful Irish sweater from the 1960s that was barely worn. But that’s a story for another post. 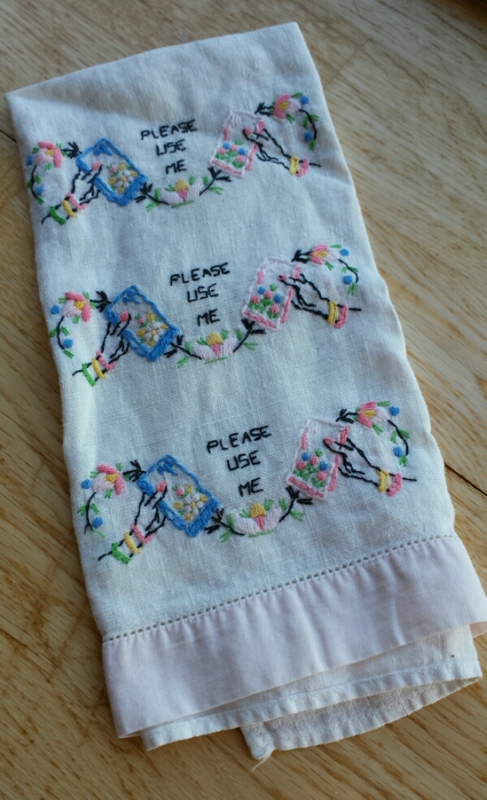 I don’t know how old this linen napkin is, exactly, but I’m guessing 1950s. What do you think? These days it’s not uncommon to introduce snarkiness and irony into crafts, and humor rightly challenges and subverts the expectation that handcrafts are staid or old fashioned. I love that. So, while it would be silly to assume that our predecessors had any less fun than we do with needle and thread, it’s great to have stumbled again upon a little proof.